Mouse cursors let you simulate mouse movements. They're great for software training and simulations. Choose from a gallery of cursor styles. Add sounds and visual effects. Control the path, timing, and speed of mouse movements. You're in command. There are two ways to add mouse cursors to a project. 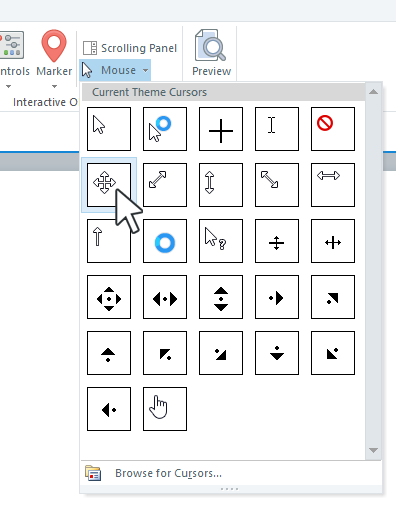 First, Articulate Storyline automatically adds mouse cursors to screen recordings when you insert them as step-by-step slides. While Storyline does the work of adding mouse cursors, you still have the opportunity to adjust their styles, effects, paths, timings, and speeds (see the following sections for details). On the slide where you want to insert a mouse cursor, go to the Insert tab. Click Mouse and choose a cursor style. It'll automatically appear on your slide. Tip: Only one mouse cursor can be added to each slide, and it must be added to the base layer of the slide. Mouse cursors aren't supported on layers or slide masters. 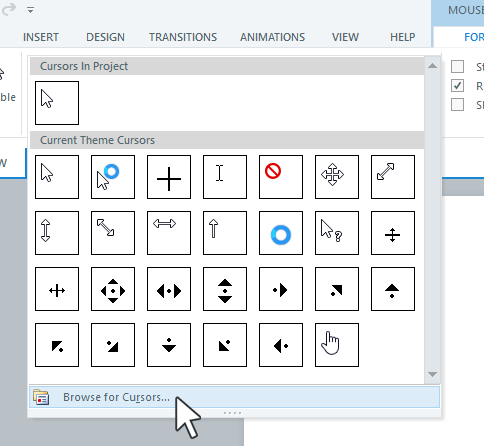 If you want to change the style of a cursor, select the mouse object on the slide, go to the Format tab on the ribbon, and choose a different style from the Cursors gallery. 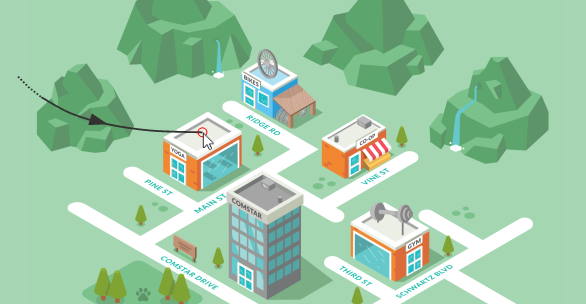 Want to use your own cursor image? Just click Browse for Cursors at the bottom of the Cursors gallery, then select any file on your computer with a *.cur or *.ani extension. When the mouse reaches the end of its path, it can play a single-click or double-click sound, or you can omit the clicking sound altogether. Select the mouse object on the slide and go to the Format tab on the ribbon. Click None, Single, or Double. To show an animated click effect at the end of a mouse movement, go to the Format tab on the ribbon and mark the box to Show Click Effects. Uncheck it if you don't want to simulate a mouse click. Choose the direction of the mouse movement and whether its path is curved or straight. Select the mouse object on the slide. When a mouse object is selected, you'll see its path represented by a black line and arrow. Go to the Format tab on the ribbon and mark the Straight Pointer Path box to make the mouse move in a straight line. Uncheck it to move the mouse in a curved line. To set the direction of a mouse cursor's motion, use the Enter From selector to choose an entrance point. Tip: If the Enter From selector is grayed out, it's because the direction of the mouse movement is already determined by the previous slide. When you have consecutive slides with mouse cursors, the end point of the first will be the beginning point of the next. A mouse cursor is visible for the entire duration of a slide. However, you can change when its movement starts and ends. You can also make it slow down before the end of its path. Select the mouse object in the timeline. Drag its left edge along the timeline to adjust when its movement begins. Drag its right edge along the timeline to adjust when its movement ends. Unlike other Storyline objects, the beginning and ending of a cursor's movement is controlled by the timeline, not the appearance and disappearance of the cursor itself. By adjusting the timing of a cursor's movement, you're also controlling its speed. A shorter duration results in a faster motion, and a longer duration results in a slower motion. 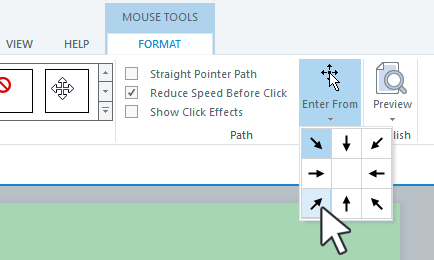 If you want the mouse movement to slow down just before the end of its path, go to the Format tab on the ribbon and mark the box to Reduce Speed Before Click.